Do you ever hold back on buying a few new things because you already have enough [i know, i know... as if a girl could really have enough of anything], don't really need it, or simply because it's just not in the budget right now. Yeah, same! ....and THIS is how hauls are eventually conceived. I had always thought that my accessory game was strong until I started to feel like I wearing the same jewelry over and over again. My jewelry display is massive in size, but why am I forgetting about all the beauties that top it off?! Could it be that the 10+ collar-length statement necklaces I own are no longer "in"? Probably. P.S. - those chic-studded thumbtacks, though! Another haul @ Target's dollar spot. 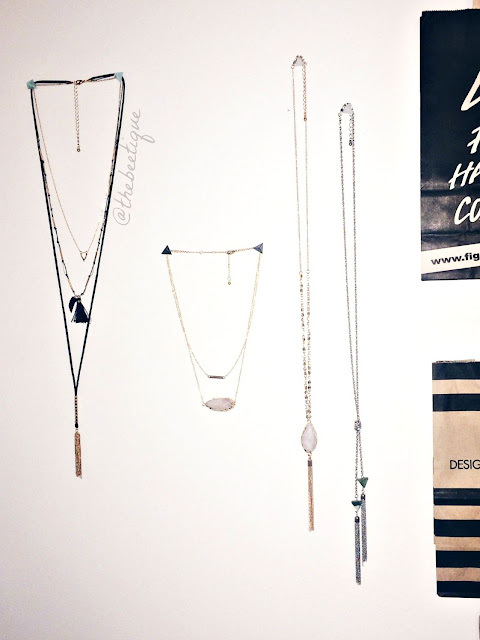 3 comments on "F21 Haul ║ Long Necklaces for Layering"